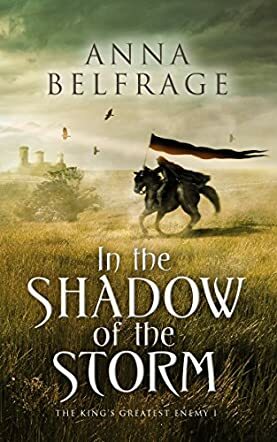 Anna Belfrage’s In the Shadow of the Storm is the first installment in her new The King’s Greatest Enemy series. The setting is 13th century England. The novel follows the adventures, joys, and heartbreak of Kit … a beautiful young woman who is forced into a marriage not of her choosing. In time she cannot avoid falling into passionate love with her new husband. But her groom, Adam de Guirande, owes his position and properties to his lord, Sir Roger Mortimer. Indeed, he owes the lord his very life and existence. And as a man of honor, he follows his lord at all costs, even into rebellion against King Edward II and his torturous, bloodthirsty ally, Hugh Despenser. When the rebellion is crushed and the vengeful retribution begins, the lives of Adam and Kit de Guirande become nothing short of a quest for survival. In the Shadow of the Storm is an epic story. Its villains are dark and heartless and its heroes are valiant. The character development is impressive. In the beginning Kit is a meek and obedient character, easily manipulated into obeying the demands of others. But as the storms of life bear down upon her, she develops a deep strength and resolve. She becomes an outspoken advocate for honor and truth. She defends her husband, family, and home with the ferocity of a wounded lioness. Her husband, Adam, also experiences a growth in character throughout the story, though not as dramatic as Kit’s. It is his unexpected and deep love for his wife that moves him beyond the typical warrior male of his time period. This love draws out of him an almost unexpected level of sensitivity. I thoroughly enjoyed the read. The proof is in the fact that I was left wanting more at the end. I am actually tempted to purchase the next volume in the set. This is the mark of a skilled and suspenseful author. England, 1321, a baronial revolt led by Roger Mortimer, Thomas of Lancaster and Humphrey de Bohun is brewing against King Edward II, which will ultimately be known as the Despenser Wars. Meanwhile, in Trestaints, Kit’s life is disrupted when she is kidnapped from her home and forced to marry Adam de Guirande, fiercely loyal to Lord Mortimer. In the Shadow of the Storm: The King's Greatest Enemy is the first part of Anna Belfrage’s historical fiction series that revolves around the life of a young, beautiful woman who has to assume the identity of her wayward half-sister, Katherine de Monmouth. And as the newlyweds begin their life together, Leeds Castle is placed under siege by the king’s forces, signalling the inevitability of war, and the real Katherine de Monmouth comes back, ready to assume her rightful place. Anna Belfrage takes us back to a tumultuous time in England’s history in her novel, In the Shadow of the Storm: The King’s Greatest Enemy #1, through the heart and eyes of Kit de Guirande. It is interesting to watch her transformation from an innocent orphaned child to a reluctant bride to a young woman who can take matters into her own hands, especially when her husband Adam is incarcerated at Shrewsbury. The book is also an intimate look at the intrigues, betrayals, and deceptions of the 14th century English court. Fast paced and full of adventure, there is never a dull moment here as it spans the course of an eventful two years. Anna Belfrage certainly knows her history and this is the reason why she can come up with an intricate and plausible story that not only entertains, but also informs the reader!